Get great looking results. Big jobs or little jobs. Get your repairs done quick. Reliable and veteran work crews. Get a free price quote. Affordable. Your satisfaction is guaranteed. Looking for a Bay Area contractor to deliver, put in and finish some brand new sheetrock? Or maybe there is a wall or ceiling that should be fixed and painted. These folks specialize in drywall installation and repairs. While a portion of their jobs are new houses, the majority of their work is with existing properties, maintenance and renovations. A number of repair projects call for nothing more than a few patches and resurfacing. Other jobs call for taking away and replacing sections of sheetrock. They work inside a variety of properties. They might be individual houses, apartments or commercial properties. 1. Bring the drywall sheets to the work area. 2. Install (or hang) the sheets onto the walls and ceiling. 3. Clear up and get rid of rubbish and extra product. 4. Tape the joint seams between sheets and put on joint compound to every taped area and screw head. After all your surfaces are textured and dusted off, they are ready for painting. Most homeowners simply have the contractors carry out the complete job, from start to finish, although some have them only complete a couple of these activities. 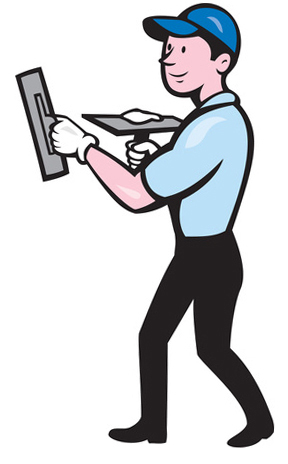 For example, some individuals will have them just do the delivery and installing of their sheetrock. They’ll have somebody else perform the final finishing and texture application tasks afterwards. Sometimes they get called out to projects where the sheetrock is already up, so they just need to do the taping and sanding and finishing aspects of the work. They can also bring out and install special fiberglass-based wall boards for high humidity locations, such as showers and tub areas. And they also provide unique extra-strong wall boards they use on walls where you choose to stick tile. They believe they can deliver whatever service you need. Sheetrock can get damaged in numerous ways. It doesn’t take very much effort to make a dent or hole in a wall or ceiling. If the holes or dents in your walls or ceiling are pretty small, you might like to try to fix them by yourself first. Small holes or dents are treated with a flexible patch and drywall joint compound solution. 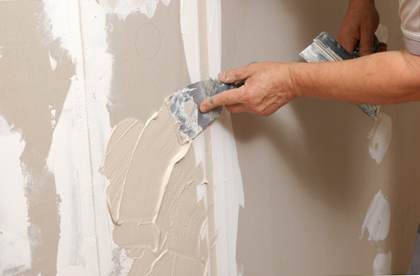 Applying a wall patch isn’t as simple as it might appear. Most homeowners can’t get it blended in right and the surface texture doesn’t match too well. Even though we encourage homeowners to not hesitate to try small repair projects, we normally feel that bigger repairs, especially in the primary areas of a home, be handled by a professional. They finish and texture your new materials to suit the surfaces of your existing ceiling or walls. Fixing a couple of separate holes or seam splits. Repairing a few panels so some walls or room can get painted. Taking out and replacing pieces of sheetrock damaged by moisture or something else. Completing the elimination and replacement of a big area. Frequently due to a water problem or other serious event. From small problem mending to big replacements and repairs, they have the experience doing it. Simply unfinished surface – only taped, best for unfinished work rooms or garage areas. Smooth surface finish – no texture, ready for painting or wallpaper. Simple texture – can provide a little extra dimension. Greater texture – hand-troweled and is more difficult to do. Texture match – your new wall surfaces match up with your old ones. Many individuals aren’t major fans of popcorn ceilings texture. If you would like to remove your current ceiling surface, they can do it. They’ll exchange it with something more modern. This company focuses on doing interior wall and ceiling projects in NorCal. They work hard to provide top job results at a reasonable price. The product they use in their work projects are the best quality. And they use the perfect tools and equipment to complete the job the right way. Most remodeling jobs generate a little mess. These job crews try everything they can to minimize the dust and keep it contained to a small area. They also bag up and haul off all the garbage they created, plus any unused materials. Lots of their projects are inside single family homes, but they also work at apartment buildings and industrial properties. They are not the only business in town who can handle your upcoming project. But they hope you might consider them to do the job. They are happy to include an estimate. The end price of a job can depend upon several variables, but the quantity of materials and how many work hours it would take to get the job done are usually the top two factors. Since there can be so many variables, it’s best to speak with them on the phone to get a quote. Do You Want To Do the Painting? If you would like them to paint your interior walls and ceiling, they’ll be able to do that too. In case you don’t want them to paint it, you can hire a different painter or just prime and paint it yourself. They are happy with whatever you decide to do. They can work at most properties in San Francisco, the North Bay and the Peninsula. If you have a project in or near downtown – The Financial District, Chinatown, Nob Hill or the downtown zip codes of 94108, 94109, 94115, 94111, 94102, or 94104 – call. Do You Work in My Area of NorCal? They work on homes and business properties including downtown San Francisco, the Financial District, Chinatown, Nob Hill and the 94115, 94108, 94109, 94111, 94104 and 94102 zip codes. They also visit almost all of the suburbs.